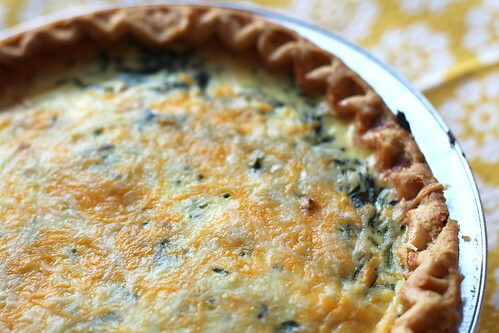 I've had this quiche bookmarked forever but have always been sort of scared and anxious about making it. The truth is, though, that it's so much less intimidating than I had feared. That's usually the case with with me for most things in life, whether it's trying a new recipe or giving birth! My blogger friend Kate swears by this recipe, and now I understand why. It's the kind of recipe that's so easily adaptable to whatever you have in your kitchen. You can throw any protein and veggie into the mix and it'll almost certainly taste good, especially if you douse it with cheese too. The combination of spinach sauteed with garlic + chicken apple sausage + Mexican blend cheese was a total gamble, one that paid off. It was a good lesson on trusting my instincts in the kitchen. I'm really good at following recipes but it takes a lot of courage for me to feel confident about riffing. It's a good thing that the frozen pie crusts come in 2-packs, because this is going to be on the menu again really, really soon. The most important thing is to make sure that your mixture fits into the pie crust and doesn't overflow, so just keep an eye on it. This recipe was a bit tricky because I was using different ingredients than Kate's recipe so I needed to eyeball how much spinach and sausage to add. I wound up adding fewer ingredients than I thought I'd need because of this. 1. Preheat oven to 400 F. Bake pie crust for 10 minutes and remove. Reduce oven heat to 350. 2. In the meantime, grill sausage on a griddle or grill pan over high until heated through. Slice thinly and set aside. 3. Over medium-high heat on another burner, heat olive oil until shiny. Add garlic and saute until fragrant but not brown, about 30 seconds. Add spinach and saute until wilted. Set aside. 4. In a medium bowl, combine eggs, yogurt, garlic salt, and 1/4 cup of the cheese. Add in the sausage and spinach in small batches if they're still warm to prevent the egg mixture from cooking too quickly. Once it's all combined, pour the mixture into the parbaked pie shell, being careful not to overfill. 5. Bake at 350 for 20 minutes. Sprinkle the remaining 1/2 cup cheese on top of the quiche and continue to bake for 25-30 more minutes, until completely set. Remove from oven and cool for at least 15 minutes before slicing and serving. Great combo of Spinach and Chicken Sausage! I'll have to try this in my quiche!